Majority of the Adidas X 18.3 Firm Ground’s reviews expressed the how comfortable the shoe is. Several customers have praised the football boot’s good fit. A couple of wearers commented on how they liked the look of the football boot. A number of users felt that the Adidas X 18.3 Firm Ground football boot is reasonably priced. A significant number of buyers shared that the pair has a good quality. A pair of buyers expressed that the Adidas X 18.3 Firm Ground football boot has an initially tight fit. One person found that this Adidas football boot model is slightly small. While part of a low-tier model, the Adidas X 18.3 Firm Ground football boot has a number of valuable things to offer its wearers. Majority of the users of this football boot model are very happy with the level of comfort it provides. Quite a number of customers are also pleased with the shoe’s good fit. Although, an important note for this shoe is that a few users found its fit a bit tight. Overall, for players looking for comfort on firm ground courts that is reasonably priced, this might be the shoe for you. The point threes are a lot of bang for the buck. It weighs 243 grams and will cost you eighty euros. And while, of course, the materials used aren't near as awesome as the materials used on the higher end models, as well you actually still get a solid performer boot for the money. As one of the low-tier models of the Adidas X 18 series, the Adidas X 18.3 Firm Ground football boots pair comfort with affordability on the pitch. Sporting a dual-layered, mesh-based upper, the shoe is designed to bring breathability and flexibility. A special Clawcollar is also integrated into the shoe’s design. This collar type in a low top cleat secures the foot down with its sock-like construction. It creates stability and support during play. An asymmetrical lacing system further the boot’s fit while making more space for the lateral strike zone. The outsole of this model is created with a thermoplastic polyurethane outsole. This material is a well-known element among football boots as it brings traction in firm ground courts. The stud configuration is a combination of arrowhead and conical studs with a total of eleven integrated into the forefoot and the heel areas. The Adidas X 18.3 Firm Ground football boot provides a sock-like fit through its mesh-based upper. This type of upper material hugs the foot while providing a lightweight feel for players on the pitch. Additionally, football boot security and stability is brought about the model’s Clawcollar design which hugs the player’s foot, locking the foot down. It is available in men’s standard sizes ranging from sizes 8 to 13. An asymmetrical lacing system has been incorporated into this shoe to personalize its fit further. The style of the lacing system is quite different from the traditional one integrated into the popular Adidas Samba Classic. A speedy and breathable ride on the pitch is what the Adidas X 18.3 firm ground football boot brings players. A mesh-based, dual-layered upper has been incorporated into this boot’s construction, affording players a sock-like fit. A specialized Clawcollar provides players a secure fit allowing a more secure hold for the shoe. This collar type is fashioned to extend to the heel area. The front part, which incorporates a tongueless design, is also extended. While opting for a more modern design without the tongue, an asymmetrical lacing system is installed, providing players fit customizability and further foot lockdown. Aesthetically coherent with the X silo, the collection’s branding is highly visible in the heel area. Additionally, the Adidas logo is also a stand-out on both the lateral and medial sides. The outsole of the Adidas X 18.3 FG football boot delivers traction on firm ground courts through a TPU-based material. This element is lightweight while providing a decent amount of grip, hence, it is a usual feature among football cleats. The stud configuration is a combination of arrowhead studs and round studs which are placed in the forefoot and heel areas, respectively. There are a total of eleven, with seven arrowhead studs in the forefoot and four round shaped ones in the heel area. This stud pattern is designed to bring grip in the firm ground courts while allowing for stability. This model shares the same stud design as its top-tier counterparts which include the Adidas X 18.1 Firm Ground and the Adidas X 18.2 Firm Ground football boots. 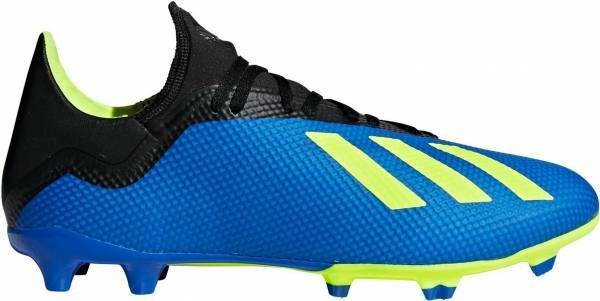 The Adidas X 18.3 Firm Ground football boot is available in the football blue, solar yellow, and core black colorway.